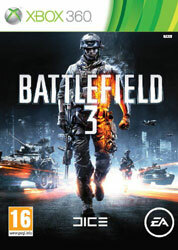 A good multiplayer game has the ability to hook me like nothing else, and Battlefield 3 really, really is. In terms of days it’s already my most-played 360 game in terms of days, and even though I’m not nearly done with it, I’ve still clocked more than 86 hours at the time of writing. That’s almost unheard of for me, and the only thing I can think of that come close is the 120 hours spent one wonderful summer on Return to Castle Wolfenstein’s multiplayer. Another class-based multiplayer FPS? Funny, that. Fair enough if you think the campaign is mediocre at best, because it is. A couple of highlights aside, it’s not even as good as Bad Company 2’s offering; the most uninteresting kind of generic hoo-ah Black Hawk Down nonsense. But I still don’t care; it’s a Battlefield game, and as such it’s kind of a new thing to even have a single-player campaign. Don’t bother if that’s what you want most in a game because you will be disappointed, and you’ll be going into this game for the wrong reasons. I’m now conscious that I’ve put more criticism into the game at the top of the list than any other here, so allow me to gush a bit. There are more polished multiplayer games, there are more popular ones, but none is better at the epic feeling of taking part in a real battle than this. Playing the attacking team on Tehran Highway, cresting that first hill in a convoy of tanks, APCs, jeeps and infantry as the defenders try to repel you, missiles launching in the background. Fighting your way up the hill in Seine Crossing towards the M-COM stations, taking it in turns to draw defending fire as your team pushes forward before putting a rocket into the building where the enemy snipers are holed up. Sneaking up behind the tank that’s giving your team some grief to stick some C4 to it. Perfectly judging the drop of a bullet through your ballistic scope to put a bullet into someone’s head from half a kilometre away. The fact that this kind of thing happens on a nightly basis keeps me coming back and will likely continue to. The beauty of these kinds of lists is that they’re personal, and the position of Battlefield 3 reflects how, no matter how much I value great writing, classic characters and innovative game design, the fundamental reason to play games is to have fun. Plenty of other games did that this year, but none did it better than this.